I have over a year on their Insider rims. Quality is fantastic. I think I still own a spoke wrench, but it’s been collecting dust since I built these. Ride quality is already excellent on gen1. 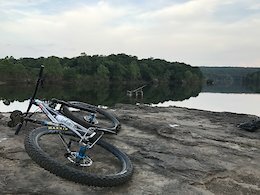 Here in Northwest Arkansas, I've been joking about rebranding my $6k Santa-Cruz with the wal-mart name and logo for a while now. And telling other riders it was $1,500 ... all joking aside, I am not surprised by this at all. I suspect the initial push is to make a great entry level race bike for NICA athletes that delivers good value. Pinkbike Poll: Do You Ride a Hardtail Anymore? I split my time equally between a Kona Honzo Ti Single Speed and and Ibis Ripmo. Both are equally fun for different reasons. I'm riding in NW Arkansas where we grow rocks. I still absolutely love the hardtail. It keeps my skills sharper, while being an absolute blast to ride on all but the roughest downhill tracks. I own these as well as the MT-Trail Sports. Great feel, ultra consistent, and very well made. If you ride mostly trail, and are looking for a more affordable option, the MT-Trail Sport is worth a hard look. I would compare overall stopping power to guide RSCs... I prefer the feel, modulation, and design of magura; but that’s personal taste. I’ve tested them on long descents such as Bennet Gap / Black mtn and for my 150lb self they’ve been plenty powerful with zero fade. I can also attest to the lever clamps rotating in a crash. I’ve twristed these many times and still no damage to report. — Does the MT5 come with the HC1 blade for 2019? The new levers are great. @DallasJW: I have a season on mine. You won't be disappointed! Build quality and ride quality are both top notch. @akvbike: Get the xtr level polymer coated shift cable and housing. Best $25 upgrade ever. I had the same issue. Now when I ride SRAM GX I think it feels cheap and clunky by comparison. @garrettstories: yeah- after trying a switchblade I 1) am ready to drink the DW koolaid, and 2) would love to see a direct comparison to the Ripmo. The switchblade was super playful, and also the most precise and stiff 29er I’ve ridden. If the Ripmo is an improvement on that, I need one.